Next Thursday is Thanksgiving. A holiday that, despite its very name, has become all about gorging ourselves on turkey, dressing, mashed potatoes and pie(s). A day consumed with televised parades featuring giant inflatable cartoon characters and televised sporting events featuring giant muscled athletes running into one another at full speed. But it is meant to be a day to pause and reflect. To evaluate the past year and count our blessings. 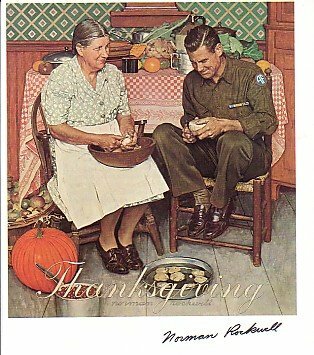 To give thanks for all that we have. In that spirit, this edition of the Health Wonk Review takes a look at the best of the health policy blogosphere from the last two weeks. While not all the entries are good news, I think you’ll find that there’s a lot here to be thankful for. And, of course, I’m thankful for such a talented group of bloggers with which I get to interact. 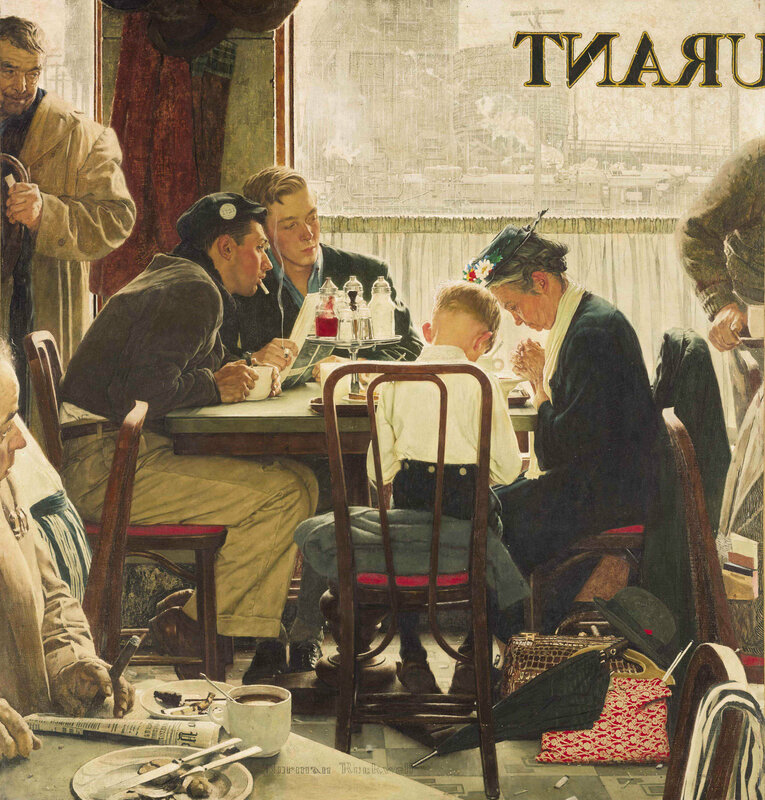 And, for good measure, I’ve interspersed this post with some of my favorite paintings by the classic American artist, Norman Rockwell, whose work evokes the holiday spirit for me. We lead off this edition with a post from the Health Affairs Blog entitled “To Understand Climbing Death Rates Among Whites, Look To Women Of Childbearing Age,” that examines one of the biggest stories in health services research this year. Laudan Aron, Lisa Dubay, Elaine Waxman, and Steven Martin of the Urban Institute look at a recent study by Anne Case and Angus Deaton, describing rising mortality among whites, that received national attention. Aron and coauthors focus on one important missing point in the Case-Deaton study: the particularly notable mortality rate increase among women. They write: “By not looking at men and women separately, Case and Deaton failed to see that rising mortality is especially pronounced among women…Our own analysis of the same data used by Case and Deaton shows that the average increase in age-specific mortality rates for whites age 45-54 was more than three times higher for women than men….By lumping women and men together, the study also missed the important point that the increases in mortality are affecting women of reproductive and childrearing ages, a finding that has huge implications for children, families, and communities.” Thus, a fitting picture would be a young couple breaking a turkey’s wishbone. Perhaps she’s wishing for a decrease in mortality for her and her peers? Next in a post entitled “Dreaming On – The Illusions of the Leaders of Large Health Organizations, as Illustrated by Medtronic’s Founder,” we have Roy Poses of Health Care Renewal writing about the recidivism of large healthcare organizations, which have repeatedly been subject to legal actions and settlements for allegations, sometimes proven, of various bad behavior. According to Poses, “These behaviors seem to recur partly because they are so remunerative for the organizations involved and their top managers, and because while the organizations may sometimes be subject to monetary penalties, the managers almost always have complete impunity.” He offers up the case of Medtronic’s founder and the corporation’s troubled legal history as an example. What picture best encapsulates just about any post from Roy Poses? 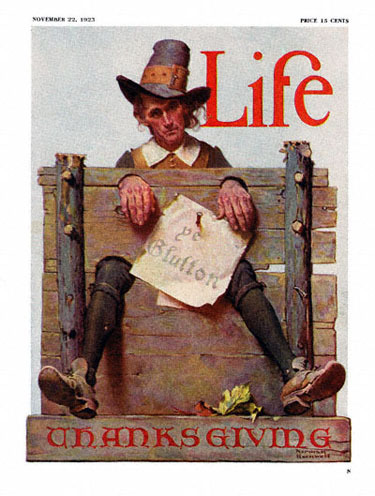 Why, Rockwell’s “Freedom of Speech” of course. We health wonkers have pretty positive regard for our fellow wonkers. Case in point: Julie Ferguson cites an article by Joe Paduda in her post “Misunderstanding the Business of Workers Comp” at Workers Comp Insider. While it’s no mud wrestle, there’s some controversy afloat that you may want to check out. 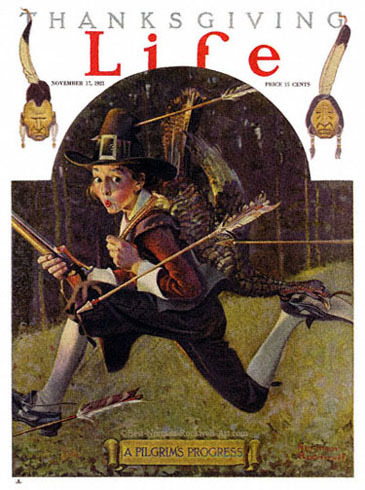 Since the post seemed to call for a little playful confrontation, what better than a pilgrim fleeing the arrows of the Native Americans? Next up, David Williams of the Health Business Blog asks the pressing question: “What do obese, middle-aged and older mute Americans with Type II diabetes do for fun?” His answer, in a post entitled “Invokana Makes Diabetes Fun Again!” is that they pull Invokana frisbees down from the sky and change their lives. It’s a different kind of post, for a very different kind of pharmaceutical commercial. Check it out. If we’re talking diabetes, I think that warrants this painting of an older, overweight chef, smoking a cigarette and enjoying a cup of coffee at the end of his shift on Thanksgiving. Another post about paying for value rather than volume comes from Jason Shafrin at the Healthcare Economist. Jason writes a post entitled “Does Tying Payment To Quality Improve Quality?” in which he examines efforts by CMS to tie 90% of reimbursement to measures of quality and explores whether or not it will work to improve quality. You’ll have to read his blog to find out. And–I’m really stretching the metaphors here–speaking of quality, why not a picture of a son spending quality time with his mother peeling potatoes in preparation for the big feast? Speaking of CMS, Brad Flansbaum writes “CMS Just Paid for Advance Care Planning, But You’ll Still Make More Giving Injections” at The Hospital Leader about the agency’s decision to reimburse conversations between doctors and their patients about advance care planning. Somewhere Sarah Palin is freaking out that the death panels have arrived. However, Flansbaum questions whether the reimbursement will be enough to change a medical culture that has not prioritized these important discussions, and is still driven largely by fee-for-service volume-based payments despite the best efforts of the ACA. Perhaps a reminder that we should learn to be more satisfied and less greedy is in order. After all, no one likes a gluttonous pilgrim. And that brings us to the ACA, which a lot of folks wrote about. First up is Joe Paduda of Managed Care Matters with a post entitled “ACA – What Can We Expect In The Healthplan Market In 2016.” He says markets are evolving, healthplans are failing, and hospitals are complaining. About what we’d expect in this brave new world! What are really failing are the co-ops. As critics continue to hype the steepest health insurance rate increases, and co-ops fail, this might make a lot of people wonder “Is Obamacare Collapsing?” but health insurance industry whistleblower Wendell Potter reassures us that the Affordable Care Act is far from a disaster for the millions who are gaining coverage in a post at the HealthInsurance.org blog. And even more importantly, a lot of people don’t realize how blessed they are. At InsureBlog, Hank Stern writes “Leaving Money On The Table – An Update” underscoring that more than 2 million people eligible for federal subsidies to help them purchase insurance aren’t getting a penny of that money, because they failed to purchase a qualified health plan through the Marketplace. So, on that note, let us all take a moment to pause and give thanks for the many blessings which he have received, and continue our efforts to make sure that we do what we can to bless others less fortunate in our midst. Happy Thanksgiving all!